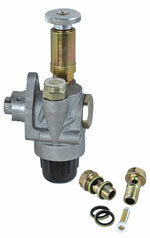 Mechanical fuel pump for the engine of the Multicar type M25. Fit for the engines of the Multicar type M25. Rubber seal for the sensor of the fuel gauge as an single part. Fit to all vehicle models: Trabant 601, Trabant 1.1, Wartburg 353, Wartburg 1.3, Brakas B1000, Barkas B1000-1, Multicar. Fit for the diesel engine of the Multicar M25. Diesel hose with 2x connector eyelet for banjo screw. Fuel resistant rubber hose with meatal sheathing. Sealing ring for the banjo screw M14 made of copper.